Same formula as before, proven with Will Smith and Tommie Lee Jones, enhanced by what I believe is an Oscar-worthy performance by Josh Brolin, as a Jones’ younger incarnation. Perfect imitation, fun to watch, as is the movie as a whole, with a cool villain, Boris the Animal (Jemaine Clement) nasty with an internal mind-blowing arsenal of which he makes liberal use. 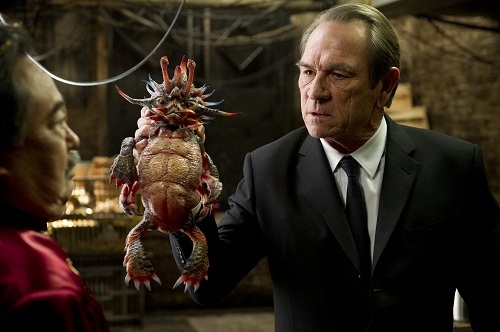 I didn’t recognize Nicole Scherzinger as the villain’s girlfriend early on (he’s not a sentimental type). This met my expectations for fun, action fluff, and surpassed them with the touching ending. I was hoping Bill I. would repeat his ‘laugh stats’ from his review of ‘The Dictator’ and expand them to include ‘power laughs’ like they have for boxing matches! As an action/sci-fi/comedy sequel it’s tough to do a great job in all aspects so while this isn’t great in any area this is good enough to be an amiable third movie in the series. Josh Brolin’s performance was excellent and the hilight of the film. As Bill points out they successfully add another element with the touching finish and it’s worth checking this movie out. This weekend is the beginning of the Summer Classic Film Festival in downtown Austin’s historic Paramount Theater. From late May through early September the Paramount showcases a diverse set of films with many different genres ting from the silent era to recent ‘New Classics’. This is a great opportunity to some old favorites or something you’ve never seen on the big screen. Many of the films are shown as part of double features and there are usually themes that last several days. Some of this year’s themes include Hitchcock week (The Birds, Rope, 39 Steps, The Man Who Knew Too Much, North By Northwest, Strangers on a Train), Comedy Classics (including Waiting for Gufman, Best in Show, Bringing Up Baby, The Philadelphia Story and many others), Horror Week (including Nosferatu, Freaks, The Exorcist, etc.). Those are just a few examples. The full schedule is at this link. Prices are reasonable and a book of 10 tickets is only $50. The opening weekend films are To Kill a Mockingbird, Pillow Talk, All Quiet on the Western Front and The Sting. If you’re looking for something cool to do on one of those 100-degree afternoons, a double feature at the Paramount is a great choice! Sacha Baron Cohen is at it again with another politically incorrect, raunchy comedy. If you don’t like Cohen’s type of movie there is no reason to read any further – this movie is not for you. Instead of his fictional character roaming around in the real world, Cohen plays a dictator looking for love and trying to preserve his dictatorship in a totally fictional story. Of course, everyone/everything is fair game to be mocked including our political system, race relations, dictators around the world, etc. This is not nearly as good as Borat but a little better than Bruno (which I thought was sort of mean-spirited). This movie had a lot of very funny moments but also had a lot of misses. If you’re a Cohen fan, the hits will outnumber the misses and will make for an enjoyable night at the movies. I decided to count the “hits” to analyze exactly how much fun this movie is, and for me I had 63 LOL moments! That’s more than I could hope for, expecting maybe 12 times when I had to do more than smile but make laughing, guffawing and other shout-outs type sounds. Yes, many were spurred from one-liners, low brow scenes, skits that were crammed into the story plot (e.g. tourist helicopter scene), but so what, isn’t that what made Woody Allen famous? Proud to note my fellow high school alum, David Mandel, is one of the writers (he was key writer on Seinfeld – remember “Man Hands”?, and now on Curb Your Enthusiasm). Keep the laughs coming!!! Quick review: pleasant, charming romantic comedy from Judd Apotow’s production group, co-written by, and co-starring, Jason Segal. Emily Blunt plays Jason’s fiance, and for various reasons their engagement is delayed, then endangered then concluded in a way I won’t give away here. Some very funny moments, and some typical plot twists. I love both of these actors, but after having recently viewed Her Sister’s Sister, where Emily Blunt also plays a similar role, where her best friend and her take years to cement their relationship, I see that The Five-Year Engagement plays it too safe and comes across as too predictable. Her Sister’s Sister is more exciting, more outrageous fun moments, and ultimately a more satisfying ending. The most obvious common thread of these two films is Emily Blunt. Her amazing ability to act without appearing to be acting, and often appear to be improvising, is enhanced by her likability and charm, and goofy laugh, making it believable that these guys fall in love with her and stay in love after years and various travails. My advice: wait until Her Sister’s Sister comes out (I saw it at Tribeca Film Fest). I thought this movie was ok but it didn’t live up to my expectations from Jason Segal and Judd Apatow (producer). I was hoping for another Forgetting Sarah Marshall (since Segal wrote that too) but I didn’t think The Five-Year Engagement was nearly as funny. As Bill points out, the film was very predictable and, while you would expect tension between the couple in a romantic comedy, there was so much here that I would have been ok if they didn’t get together at the end. I also thought the ending was a little too cutesy (is ‘cutesy’ a technical movie review term?). The movie did have some good moments and I thought the best performance was by Chris Pratt (from Parks and Recreation) in a supporting role. It’s summer! It’s only Cinco de Mayo but with the release of the first blockbuster it must be summer! (And it is in the mid-90s in Austin already.) The Avengers is a good start to the summer blockbuster season. The Avengers brings together many of the characters in recent Marvel comic book-based movies: Thor, Captain America, Iron Man, The Hulk, and a couple of additional ones. All of these superheroes come together under the direction of Nick Fury (Samuel L. Jackson) to save the world from Thor’s brother and his army. I didn’t see the Thor movie so I didn’t know the whole backstory…but is that important? Of course not! I won’t wreck the ending for everyone but suffice it to say that, based on the number of sold out showings this weekend, there will be a sequel! Joss Whedon did a great job of directing this excellent cast: Mark Ruffalo, Robert Downey Jr., Scarlet Johansson, Jackson and others. There is good character development for a superhero movie and lots of action as well as light moments and humor. I thought this was the rare movie where the 3D was worthwhile. If you like this genre, you should definitely see The Avengers. One of the key themes of the movie is teamwork. I would recommend that Carmelo Anthony see this movie before the Knicks lose game 4 vs. Miami on Sunday. Carmelo could definitely learn a valuable lesson here, but unfortunately he probably does not read this blog. Luckily, the San Antonio Spurs do not need to see this movie. Unlike Bill C., I did not see the 3D version, so maybe that’s why I rated it a little lower. I enjoyed it, agreeing with Bill’s points above. I’ll touch on a few additional points. First, the villain, Thor’s brother Loki, played by Tom Hiddleston, was perfect, really bad person, scary motivation (Hitler-like), and off balance enough that we can relate to real-life bad guys home grown on Earth. The only reason you would want to see the Thor movie (really bad) to understand this film is the throwaway reference to Natalie Portman’s character. One review I read resonated with me here: this is best as a comedy with lots of one-liners delivered masterfully, by superb veteran actors. Mark Ruffalo, Robert Downey Jr., ScarJo, Sam Jackson and Jeremy Renner. The script is preposterous, but the action and characters kept me interested. My major disappointment is the over-reliance on the destruction of NY City, although the superheroes thoughtfully tried to limit the damage to Grand Central Station and a 3 block radius. Notice the lack of a US President calling the shots, instead it’s The Council, who reminded me of when President Gerald Ford was paraphrased by the NY Daily News back in the day as saying “Drop Dead New York”. Some side notes: I was pleased to see Cobie Smulders in the movies for the first time, since I love her on TV’s How I Met Your Mother. Too bad she has such a minor role, looking good while taking orders from Sam and doing some shooting. Scarlett Johansson shows promise as a female James Bond in a future movie. Gwyneth Paltrow, almost forgotten by the movie’s end since she’s mainly in the begining, is naturally beautiful as Stark’s (aka Iron Man) assistant/lover/homemaker, and for some reason walks around barefoot. In response to Bill’s sports analogy above, I would liken the following athletes to the Avengers: Ron Artest aka Metta World Peace as The Hulk, Derek Jeter as Iron Man (credit radio sports talk host Robin Lunberg), Pat Tillman (NFL safety turned military volunteer and victim) as Captain America, Jerry Reese (NY Giant GM) as Nick Fury (again from Lunberg), and Mariano Rivera as marksmen Hawkeye. You can’t go wrong with a movie from the Claymation experts from Aardman Studios. These are the same guys who produced the Wallace and Gromit films and Chicken Run. Claymation has now been replaced by CGI, but this movie still has the same look and feel as the earlier films. The Pirates! is set in the 1800s, and the hapless Pirate Captain (voiced by Hugh Grant) is once again trying to win the coveted Pirate of the Year award. Things look bleak until the pirates board Charles Darwin’s boat. 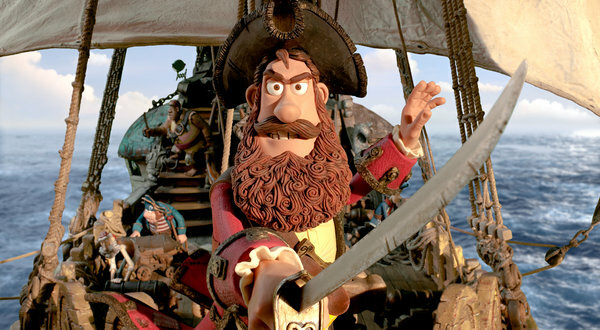 As typical for an Aardman animated film, there’s plenty of ridiculous mayhem, characters. trivia, and background activity to keep all ages entertained. While I didn’t think The Pirates! was quite as good as the Wallace and Gromit shorts (the shorts are all hilarious) or movie, this latest film is entertaining for both kids and adults. Note: I saw the 3D version and didn’t think it added much.